My daughter is 5 1/2 and has been quilting for a year and a half. R has just finished her third quilt. Her first quilt was made entirely from my stash and her brother's stash, but soon after she started building her fabric stash. 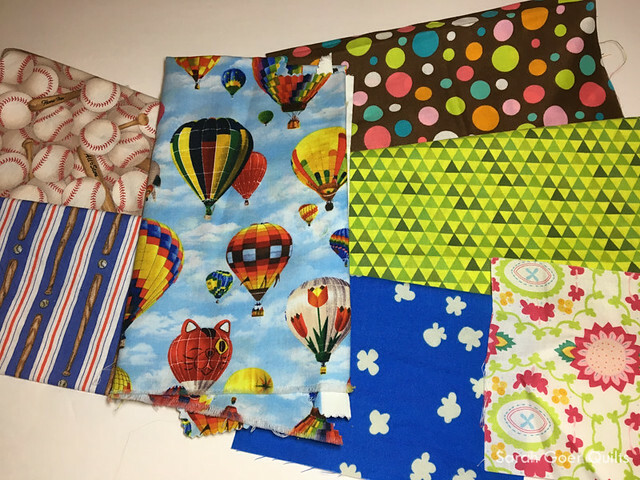 Whenever she visited a quilt shop with me I let her pick 1 or 2 fat quarters or fat eighths. I think her stash building began on our trip to Portland, OR. (There are some great quilt shops there!) I share my stash with my kids. They have free choice of most of my fabric and just have to ask first, but I think it's also nice that they have a bit of fabric that is their own. I've mentioned her stash on the blog and on IG and people have been curious about it, so I thought it would be fun to give you a little tour. This might not be 100% of it, but it's close and it's everything she had put away in her box. Probably the biggest difference in our stashes is cat fabric. I'm pretty sure I have none. Oh wait, there's one piece in a Patchwork City BOM kit. I digress. She is drawn to cat fabric. My favorite is the sushi cat fabric. Cause it's hilarious! That was an acquisition from Hip Stitch in Albuquerque, NM when we went out for Balloon Fiesta in October 2016. Unfortunately the sushi cats haven't made it into a project yet. I should point that out to her. Many of her cat prints went onto the back of her most recent quilt. She also used her whole piece of bunny fabric in that backing. She also likes purple and pink. The one on the top was a print we each picked up in a shop in Portland, OR. Many of these made it into Striped Quilt, a doll quilt R made from her friend Ellie. 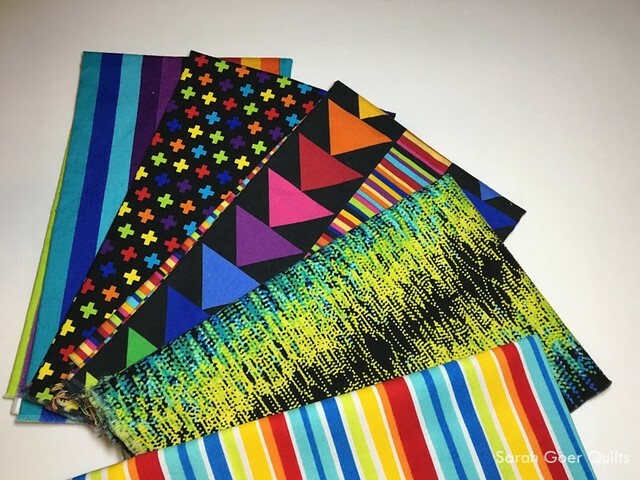 What's not to love about a rainbow print? Or a stripe? 'Nuf said. She used the second one from the bottom to make a pillow last summer. And the rest of her fabric is this little random assortment. She played a year of t-ball so she digs the baseball prints. The top print is my remnant from the dress I made for her and the shirt I made for her brother. The hot air balloon print is also from Hip Stitch, and she used it to hand sew this sweet little doll dress. The two in the top right were a gift from a couple of the kids in the round robin she participated in. And the two in the bottom right are small bits from my stash. I look forward to seeing what she makes next! Posted in Kid Stuff, Quilting. 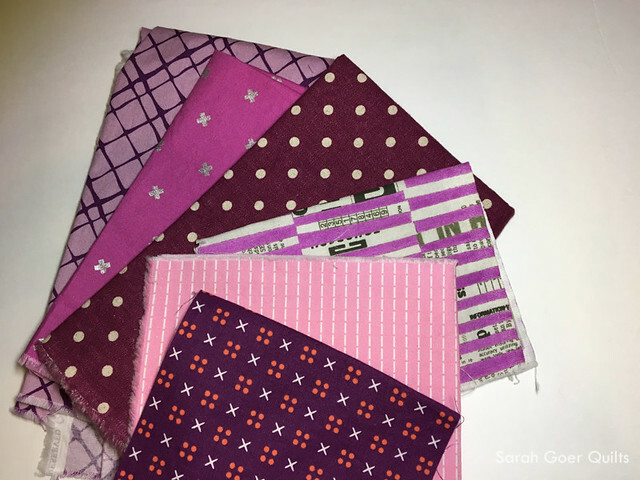 Tags: fabric on December 11, 2017 by sarah. You daughter has a great stash building! I love that sushi cat print too! Thanks, Cheryl. Both of my kids bought the sushi cats. 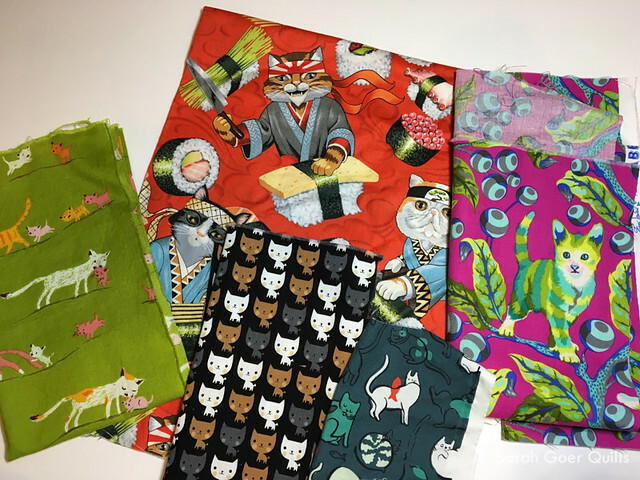 Maybe it's sushi cat fabric challenge time at my house! It's fun to see her personality a bit through the fabrics she has in her stash. The sushi cat fabric *is* hilarious! I look forward to seeing what she makes next, too. She definitely knows what she likes. We haven't been in a quilt shop in quite a while. I'll be curious to see how her tastes change. Thanks for visiting, Yvonne. The cats with Sushi is hilarious. I may need to find some of that. Your daughter and I seem to have some overlap in our stash and included in our quilts. She sure does have great taste!! Looking forward to seeing what she creates with Sushi cat!! I gotta tell you that I can compete with your daughter with cat fabric. I even have a strange looking Japanese cat fabric from my mom’s stash in the 1990s! That sounds like a great print as well. 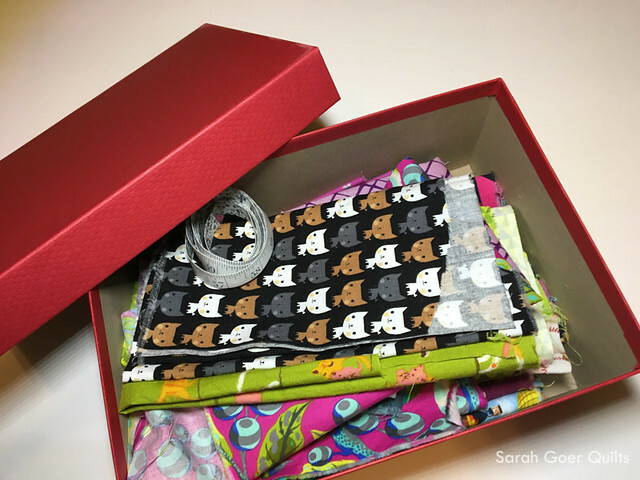 Any cat quilts in your near future?